Knight Time invaded one of the sectional March Madness tournament venues in Dayton, Ohio this past Friday. 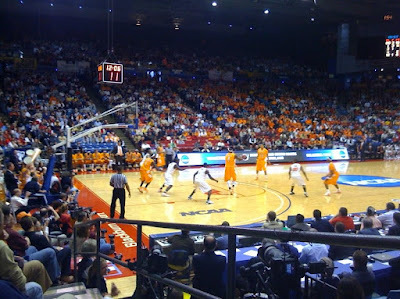 Being the consummate last minute planner, balls to wall (in this case balls to the hall), if not now then when kind of guy, Sir Hook took advantage of the games proximity to his business trip to Columbus, Ohio, and with a little help from his friend, Bruce Pearl, Head Coach of the Tennessee Vols, commandeered a 5th row floor seat in the corner of the action! 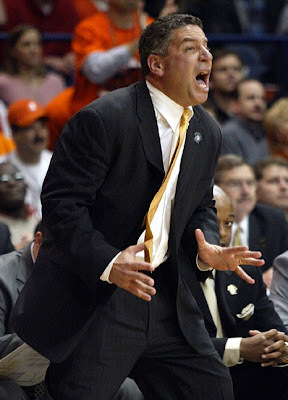 Bruce, formally head coach of the University of Southern Indiana Screaming Eagles in good ole' Evansville, Indiana, is now a famous multi-million dollar Division One sensation! Sir Hook used to help him market his coach's show for nine years in Evansville. Now, he's just a friend and a fan. 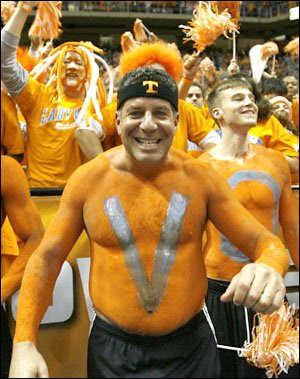 Still crazy and true to his character, Coach Pearl has taken Tennessee by storm with his infectious personality. Recently divorced, he is also enjoying playing the one-on-one game again. His ex-wife has opened a beauty parlor in Knoxville that she has named, "Alimony". Unfortunately the Vols couldn't pull off the win and Bruce, not being one to be happy with defeat left Sir Hook with tickets to Sunday's games, which he will enjoy before returning to Columbus for his final meeting on Monday morning. So tonight we'll raise a glass to Sir Bruce and celebrate life one moment at a time! I love seeing Bruce on the big stage. Unfortunately, things don't always turn out the way we draw them up on the chalk board. Still, I have no doubt that the south (at least of Vols) will rise again!